The Stromness Library Reading Group meets tonight to discuss Flann O'Brien's The Third Policeman, a suitably dark text for our Hallowe'en meeting! The old wooden tub was taken out of the shed and set squarely on the flagstone floor. It was threequarters filled with water; maybe a kettleful of hot water was added to take the chill off. Then a poke bursting with apples was emptied into the tub, where they tossed and eddied and collided with each other - ruddy fragrant spheres . I have only a vague memory of what we did with the nuts - whether they were 'dooked' for too, or simply shared out - walnuts, hazelnuts, chestnuts thinly scattered among a huge profusion of monkey nuts. We can remember doing something similar as children, with pancakes spread with syrup or treacle, hanging from a string, which had to be eaten without the use of your hands. Yummy but messy! There must certainly be some reason rooted in old magic for these rituals. Of course the apples and the nuts marked the consummation of the fruitful year. Ahead stretched the gauntness and snows of winter. 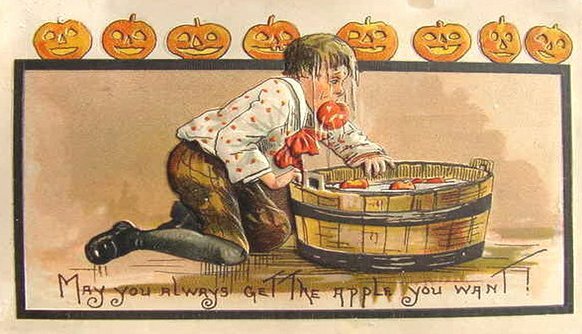 It would be good to hear your memories of Hallowe'en traditions from previous generations - please feel free to add them as a comment below this post. Trying to carve a turnip lantern - someone was sent to dig up(steal)said turnip from farmer's field, then 4 of us (siblings) spent whole day trying to scoop out the middle - obviously no parental supervision so no sharp (useful) implements allowed! Then the reward - dooking for apples, baked tatties from the coal fire and the delicious smell of burning turnip! Thanks for sharing that Annie - we too remember the frustrations of 'safe' scooping implements - which ironically led to multiple injuries through efforts at chiselling rebounding into fingers and hands, while leaving the neep itself unscathed! Oh yes, the smell of burning neep must be 'the' smell of Hallowe'en.